Do you want to grow your trading account? Then it may be high time to look at cannabis leaders Canopy Growth Corp (NYSE:CGC) and Scotts Miracle-Gro (NYSE:SMG). Across “all lines” of business, a strong blend of growth opportunity is happening off and on the price charts of CGC stock and SMG stock, and these are worth putting on the radar for purchase. Let me explain. They’re not entirely two peas in a pod. Nevertheless, both Canopy Growth and Scotts are in the booming cannabis sector, or what used to be referred to as the business of grass back when VW buses and Cheech & Chong ruled the day. Did I just date myself? More important, Canopy Growth and Scotts are bonafide leaders within their area of expertise. And right now CGC stock and SMG stock are ripe for buying as those bottom, top and squiggly price lines are offering a nice blend of the right stuff off and on the price chart for investors to grow big profits in today’s market. 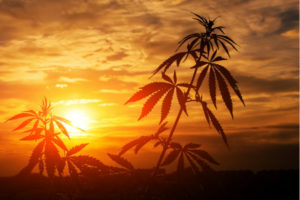 Off the price chart, CGC stock is one of the marijuana space’s undisputed leaders with its roots firmly planted in the medicinal side, but now also smartly growing its recreational-based business. Not unlike with other early stage industries such as the now-ubiquitous streaming video market such as market leader Netflix (NASDAQ:NFLX), quarterly corporate confessionals have been a mixed blend for Canopy Growth. Overall, though, the fundamental picture looks strong for CGC stock. Most recently, February’s earnings report delivered a Street-topping and eye-popping profit of 22 cents compared to forecasts calling for a loss of 17 cents. Those results are a manufactured blend of accounting allowances as CGC grows its business. As much, an eyebrow or two might be raised. Still, for investors familiar with buying growth stocks, budding sales are a reality and there’s no denying Canopy’s bountiful year-over-year revenue gain of 282%. There’s also CGC’s relationship with beverage giant Constellation Brands (NYSE:STZ). The strategic alliance puts Canopy at a sizable advantage, with working capital to grow its business, as well as distribution and marketing expertise. On the price chart, conditions for CGC stock is ripe for growing the color of money in investors’ trading accounts. Taking a look at the annotated daily chart of Canopy Growth, what had been a forecasted handle consolidation by this strategist back in the second half of February has morphed into a larger symmetrical triangle pattern. Further supporting the price consolidation’s bullish tendencies, CGC’s triangle has successfully tested the 50% retracement level a couple times and is centered on either side of the 62% level. All told, a breakout through $48 and slightly above the recent pivot high, as well as angular resistance, looks like an attractive entry point to go long CGC stock. I would add the caveat that Canopy Growth has made a habit of forcing the question “what was I smoking?” from both bulls and bears, with a decent history of technical failures. That being said, to keep any positions from going up in smoke, I’d recommend a homegrown blend of the technical and the prudent, and use an initial stop-loss below $44.40. SMG stock is our second buy recommendation inside field of cannabis. The company has been around forever and is a household name best known for its fertilizer products for growing one’s garden or lawn. But in today’s new grass market, Scotts is a major player in the field and the industry’s largest hydroponics supplier. Combine SMG’s solid “picks-and-shovels” positioning with the cannabis arena’s penchant for outsized growth potential and old-school fundamentals like price-to-sales of 1.67 or a forward P/E of 17.6x which don’t require an accounting degree and a price chart that’s planting the seeds for a breakout — and bulls have every reason to put Scotts on their radar. Taking a look at the weekly chart of SMG stock, shares have been quietly consolidating at the 50% retracement level for the past few weeks. The price action follows a two-month long rally out of a bear market and might beg the question whether, technically speaking, the glass is half-full or half-empty? With shares also comfortably above the 200-day simple moving average and stochastics having signaled and curling higher out of oversold territory on the daily chart (not shown); you don’t have to be smoking anything to see higher prices ahead. And for like-minded investors looking to cash in on today’s narrative, buying SMG stock on a breakout above $83.23 with an initial stop-loss beneath the pattern low of $79.94 is a smart way not to get smoked either. Article printed from InvestorPlace Media, https://investorplace.com/2019/03/growing-profits-canopy-growth-scotts-miracle-gro-cgc-stock-and-smg-stock/.